I have been doing some spinning around here. A while back, I had started spinning some Polworth roving on my Rose. I had decided to spin a semi woolen singles to make a 3 ply yarn, aiming for a DK or worsted weight finished size. I spun and I spun and I spun. I spun some more. I kept spinning. 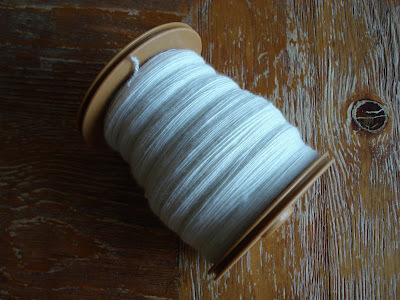 For those of you who have spun both woolen types of yarn and worsted types of yarn, you know that woolen spinning is faster. 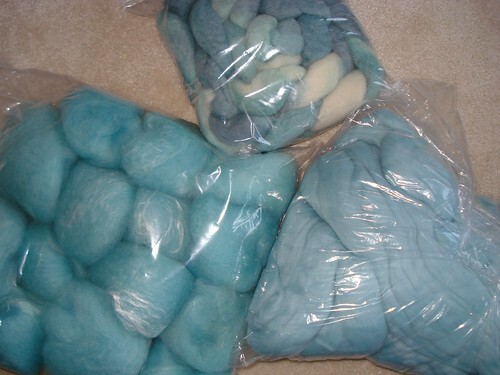 The singles are also fluffier and more airy. But still I kept spinning. The bobbin wouldn't get full. I think I've finally figured it out - somehow I've got my Scotch tension set up so that it pulls on with just enough pressure to wind a firm bobbin, and not so much that it breaks the singles. This bobbin is not squishy at all. There are probably 374, 892 yards of singles on this bobbin, which would explain why I keep spinning and spinning and spinning and the bobbin still isn't full. I decided yesterday that whatever the bobbin had by bedtime was going to be it. Since it will be a 3 ply, there's no way I can fit 3 bobbins of singles onto my plying bobbin. 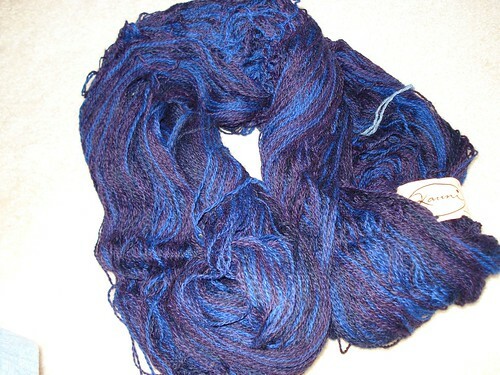 Also I'm dying to ply the ultramarine singles from the batts I dyed, blended, and carded and spun on my Symphony. It feels like years ago that I finished that and I'd love to see the finished yarn, but I need the Rose so I can use the plying bobbin. So here you see what I got done by bedtime last night. Still not a full bobbin, but I'm calling it quits on this one. which was behind me. 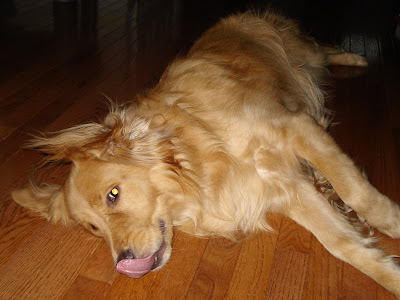 Finn just wants everyone to know that cats are yummy and should be licked like a Popsicle on a regular basis - even if they do try to bite you in the eyebrow when you taste them. May your rugs stay put and your cats stay dry today. Over the weekend I decided to start on one of the Bea Ellis Kits I picked up this summer. 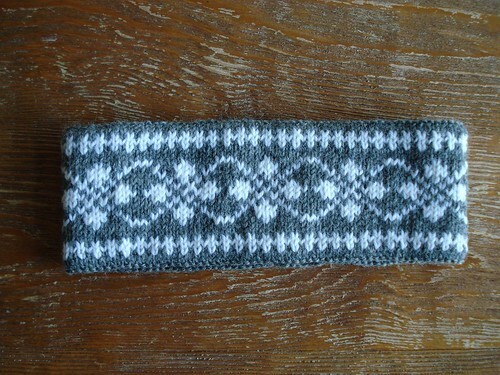 I chose the Nordic headband to start with since it's been a while since I've done stranded colorwork. This was the perfect little one day project and now I have a wool headband to keep my ears warm - and I can wear it with a pony tail! It has a full cotton lining (the cotton yarn is included in the kit along with two balls of wool yarn- from Norway of course) so it won't be itchy at all, even on cold winter days when your skin is more sensitive anyway. The lining, plus the extra thickness of the stranded yarns make it a nice, thick headband and I think it will be perfect for keeping the wind out of my ears. Last fall when I got the ear infection, the doctor actually told me to wear a hat (it was all I could do not to answer, "Yes, Mom.") We get some pretty strong winds here and when you're outside, it doesn't take long for your ears to get sore. Now that I've had a little practice on the stranded colorwork, I'm ready to knit Caleb's Skier Hat (also from Bea Ellis). 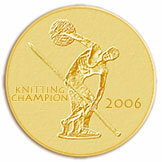 Finally, Kate of the comments yesterday asked when the Solace pattern would be available. It already is! 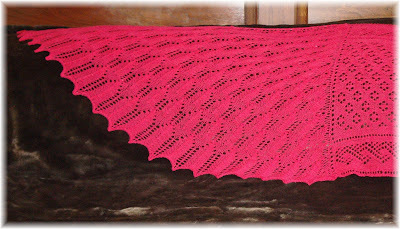 Solace is a Georgina Bow Creations Pattern and I've actually linked to the pattern page in yesterday's post (feeling a little link lazy this morning, so you'll have to scroll down). Glad you like - it will be a nice snuggley wrap when I get it done. I feel like I'm just zipping right along on Solace. 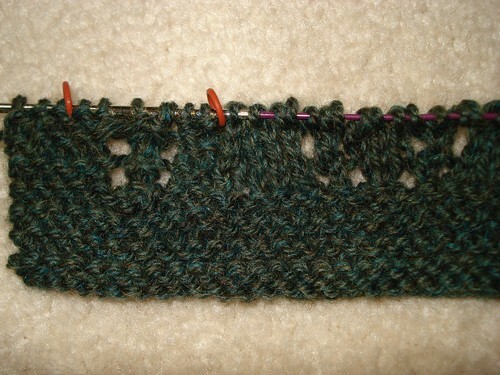 I'm now through 5 repeats of the main chart and I'm about halfway through the 4th ball of yarn (out of 12). The charts are easy enough to follow while I watch TV and I feel like I'm familiar enough with them at this point to be able to work on this at the end of the day when my mind is mush. The wrap is almost long enough now that soon Ramius will be able to sit in my lap while I work on it and not be disturbed while I flip it back and forth. At this point, he twitches his back and is still lashing his tail around everytime I change sides at the end of a row. Some of you had commented that you liked the cables on this design - there aren't any! It's actually a lace pattern that waves back and forth and makes that texture, not cables. Thanks so much for all the positive feedback on Swan Lake and The Wings of A Dream! You guys are great. There have been some questions about why Ramius wasn't in the photos and I wanted to let you know that he's fine, he just didn't want to do pictures the other day. He was getting his mid morning nap (the one right before his pre-lunch snooze and after his early morning lie down) and just couldn't be disturbed. I didn't have a lot of time to get the pictures so I couldn't work around his demanding sleep schedule. He's not in Hanami either, because it's alpaca and he has to be well baked to be around alpaca without eating it and the sun wasn't shining that day to bake him - so no cat in that one either. I will get some gratuitous cat (and dog) pictures sometime this week so you guys can get your fuzzy fix. 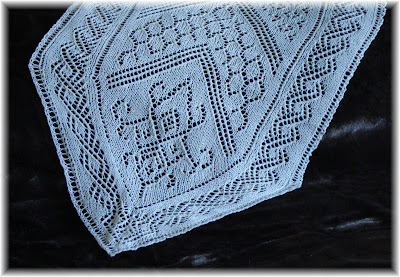 Now available in a traditional pattern format, Swan Lake: the design for Mystery Stole 3! My interpretation of the classic ballet in a knitted stole, Swan Lake combines many lace patterns into a single, stunning stole design. Beginning with a formal looking arrangement of lace, the stole ends with a wing symbolizing the cursed life Odette is forced to lead as a swan from dawn to midnight and a princess from midnight to dawn. 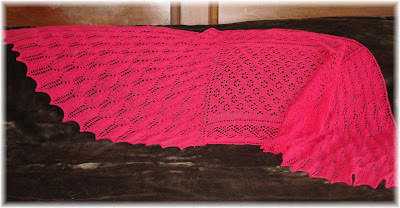 Not intended to be a design for beginning lace knitters due to the number of different techniques used, it will not be a particularly difficult knitting project for an intermediate knitter who is comfortable with working from charts. 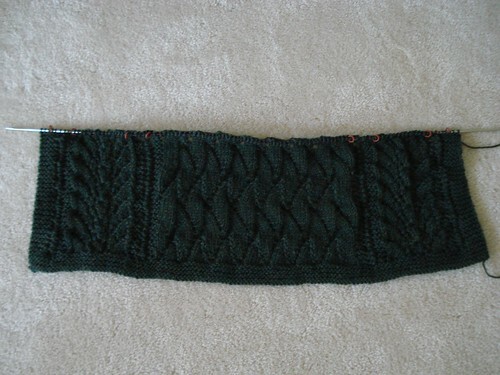 The entire stole is charted, from the beginning point of the design, through the wing created by short rows. Beads can also be added to the stole for those looking for a more formal wrap. Complete directions walk you step by step through the unique combination of techniques necessary to achieve the shaping in this stole. Also included are directions for making a symmetrical stole without a wing with a lace panel joining the two halves. As a bonus, there is a third design included in this pattern: The Wings of A Dream! As Earth bound creatures, humans have always wondered what it would feel like to have wings and soar with the birds. Knit this stole and give your spirit wings! The Wings of A Dream design is also fully charted and beaded. Again, step by step directions will take you through the creation of your stole and you too can experience your own flight of fancy. Just thought I'd enable, I mean share. I have several projects waiting in my stash for me to get started on, so I thought I'd share a few of them with you. One of the things I finally did this summer was order some hat kits and an earwarmer kit from Bea Ellis. She has put together these great kits with patterns, two colors of wool yarn (your pick) and a matching cotton yarn for you to knit a liner all for under $20.00! They all have a Norwegian influence in the design because that's what Bea Ellis specializes in. Looking for Dale of Norway? She's got it! Check out her book list - there are some gems in there that I'll be picking up soon myself. I had first seen these kits when Kary did one and thought they looked great, so I bookmarked the site and forgot about it. Well, last year I got an ear infection and had to wear a polar fleece earwarmer (we will not discuss my knitterly humiliation at this, but I needed my ears warm faster than I could knit). This summer, I realized I still hadn't done anything about the keeping the ears warm situation so I wandered over to her site and picked out a couple of kits. 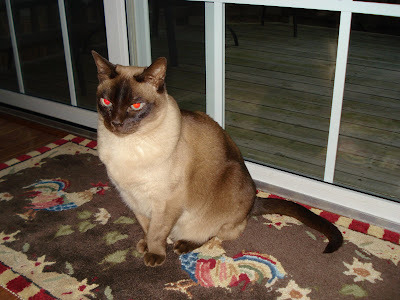 If you click here you can see her kits (or click on Bea's Originals from the home page). I picked up the Nordic Headband and the Kristen Hat for myself, and Caleb picked out The Skier hat for himself. What colors did we choose? Well, you'll have to wait until I start knitting them to find that out - but I did get in my new Knitpicks Harmony needles (the wood Options ones) and they are GORGEOUS! Really well finished and smooth with nice pointy points on them. When we woke up Saturday morning, I stumbled out of bed, threw on some sweats (yes, we are glamorous here in the mornings), and took Finn outside. Sometime during the night between Friday and Saturday the weather changed because while Finn enjoyed the brisk temperatures, I stood there shivering waiting for him. As you can see, being cold has had a direct effect on my knitting on the Solace Stole. I've got inspiration to get it finished quickly now! I've started my third repeat of the pattern and I really like the way it's looking. I think it will be a nice, cuddly wrap once it's done. I've got yarn and patterns picked out for several sweaters too so I should be able to knit my way all the way through the Fall! ...which must mean I'm finished knitting on the double winged stole! Yes, it's true. 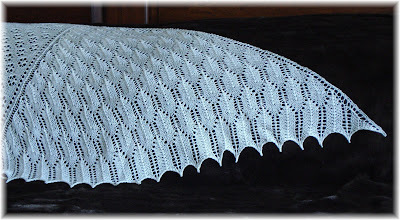 I will be blocking it this morning and I hope to get some work done on the pattern today. Once that's finished, I just double check the charts, add them, get photos of the stoles (yes, I've knit two stoles for this one pattern), proofread the pattern a final time and it will be done! I'm still not going to give you a definite date for this, but we are on the home stretch. In the meantime, as you can see above, I've started something new! This is my Mom's Solace pattern. 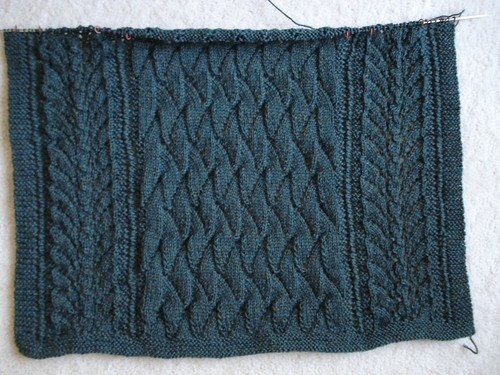 I'm knitting it in Elann's Peruvian Highland Wool in the Forest Glade Heather color. This is a wonderful color and looks just like an evergreen forest. It has the deep pine greens, the blue tones, like a blue spruce has and some olive and brown tones like the bark and pine needles you'd find on the forest floor. It's very soothing to me and I think it will be a snuggly kind of wrap for a cold day. I did make one change to the pattern (sorry Mom, but you knew I had to mess with something). I decided not to work the edging pattern, but instead worked a garter stitch edging. This will make the ends of the stole more simple than the original design, but my brain is still a bit fried from Mystery Stole 3, so I need simple right now. I also have a sneaking suspicion that Mickael and Caleb will wrap up in this and the simple edging is a bit more "man friendly." In case you're curious how I did this edging, I cast on the full number of stitches that you increase to in the original pattern after the edging, then K 1 row and P 9 rows. Then you begin the charts as the pattern directs. At the other end of the stole, I'll just reverse it. I finished the first tiny gray sock (OK, they're not as tiny as they used to be, but compared to the big gray socks I made for Mickael, these are tiny) and have begun the second. Socks are great for being portable and easy to work on at odd times. I can do socks on the phone without having to think about them. I can work on them while I'm waiting for Caleb to do things (he's feeling better now and is back in school today). I can work on them while I'm waiting for pasta to cook for dinner or a hundred other little bites of time that are too small to pull out anything bigger. I think this is a big part of the appeal of knitting socks. Once you get a feel for how they work, you don't need a book to knit them. A simple stitch pattern can be memorized, and heel turns, gussets and toes are all inter-related to the number of stitches you cast on in the first place. So all you need is some great sock yarn (the other big part of the appeal of knitting socks), your favorite sock needles and a baggie to put it in - voila, portable project! 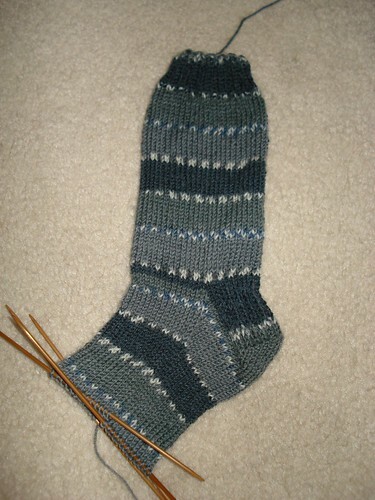 If you've never tried knitting socks, grab a sock book, some yarn and needles and go for it. Even if you decide socks aren't for you, you will at least discover the magic of the heel turn and wonder at how on Earth you were able to turn a tube of knitting 90 degrees. You'll probably become a sock addict like the rest of us though, if only for the ability to have a small, portable project to drag around with you as you run around doing everything. And buying the wonderful hand dyed sock yarns is pretty fun too! Since I'm not allowing myself to start anything new until I finish up the Swan Lake pattern*, I thought I'd show you some things that are waiting patiently in my stash to be spun. Above you can see 3 different batts/tops. From the left is Mojito Love: an Original Kitchen Sink Batt from Kary of the Knotty Sheep - now on Ebay AND Etsy (be careful, there are other people using the Kitchen Sink Batt name who didn't come up with the original concept and don't have the color and fiber sense Kary brings to her product), at the top is Love in a Mist from Delia of The Fiber Denn (also available on Ebay and Etsy), and finally, on the right is some merino top I picked up at MDS&W in Ice Blue from Ohio Valley Natural Fibers. I didn't buy these fibers to go together, but this range of colors looks good on me and I like them so I kind of ended up with a collection. When I put them all together I realized that they worked together nicely, so I'm going to spin them into a 3 ply yarn, using one color for each ply. I think it will make a very interesting yarn and if I use it this way, I'll have enough fiber for a sweater's worth of yarn! *For those of you on Swan Lake watch, I'm definitely seeing the light at the end of the tunnel now. My son has been home sick from school yesterday and today so my actual computer time has been cut way down over the last couple of days, but it will be available very, very soon. Hang in there. You knew you'd have to see gray socks again, but you know what? This is a different gray sock from the other day! When I had Caleb try on the sock in progress it fit perfectly but anyone who's ever watched a kid grow knows that you really don't want things to fit perfectly unless you're going to have a portrait taken in the next 5 minutes wearing the perfectly fitting thing. Otherwise they'll grow out of the perfectly fitted thing before you can turn around. So, I frogged the first sock and cast on again, a bit bigger this time and what you see here is Caleb's Gray Sock, Number One, Take Two. There are four stitches more in each round in this sock than in the first sock attempt, making it half an inch bigger in circumference than the original first sock. I'm Back! The little guy is back in school, we got everything taken care of to get him ready to go back, and I've pretty much figured out a routine to get everything done in the morning. The best part? I haven't had to do my drill sergeant impression yet! I'm sure there will be a morning or two that I'll have to turn up the volume to get him going, but so far, we're doing pretty great. Finn is even helping to wake him up - one morning he barked at him and the next morning he licked his face from chin to forehead - both techniques worked. I appreciate the help, but Finn has ulterior motives - he doesn't get his breakfast until after Caleb is fed. So, since I refuse to cast on anything else until the MS3 pattern is finished (socks don't count), and I'm pretty sure that you guys are sick of seeing gray socks, I thought I'd share some of the stash enhancement that's been going on around here. This is a skein of Kauni yarn in the EL colorway. I love the Kauni Cardigan pattern and I love seeing the way they are making up, so when Jannette started carrying the Kauni yarn, I had to get some. The color is photographing a little bit lighter than it really is: the navy is a very dark, almost black navy and the eggplant color is also very dark. The color that looks like royal blue in the photo is a darker, richer color than true royal. I have enough yarn to do the entire cardi in this colorway, but I'm not sure if the pattern will show up since the colors are so dark, so I might play around with using a different yarn for the second color. Finally, if you haven't heard yet, KnitPicks is now doing wood needles for their interchangeable needle sets! I had just figured that wood needles wouldn't be strong enough for a set like their Options set, but apparently they've figured out a way to get them to work. I'm very excited about this because I really prefer to knit with wood or bamboo needles and I've already placed an order for some. I can't wait to see them! I hope everyone is having a wonderful Labor Day Weekend if you live you in the US. If you don't, I hope you had a great weekend anyway. We've been running in circles around here trying to get ready for school and I think that we are ready to go tomorrow morning! Knitting, like the blogging has taken a back seat to getting everyone taken care of around here, but I did finish up Mickael's gray socks as you can see. 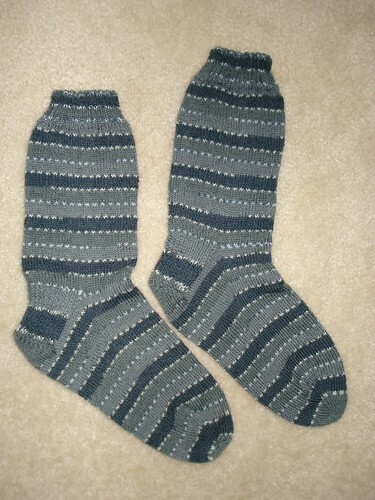 These are a discontinued color of Regia, worked on US 1's (2.25mm) in a generic sock pattern I threw together to fit his foot. I pretty much got the stripes matching through the heel flap, but from there to the toe, they don't match as perfectly. I used two different balls of yarn but they were from the same dyelot. 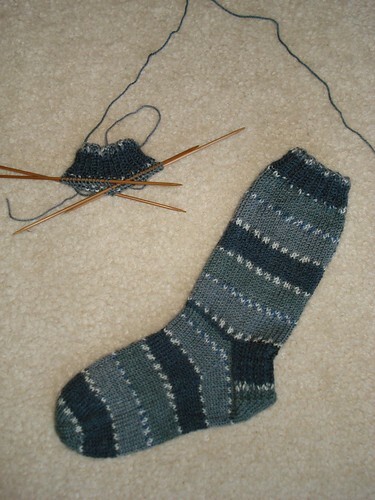 With the leftovers, I'm making some small matching socks for Caleb. 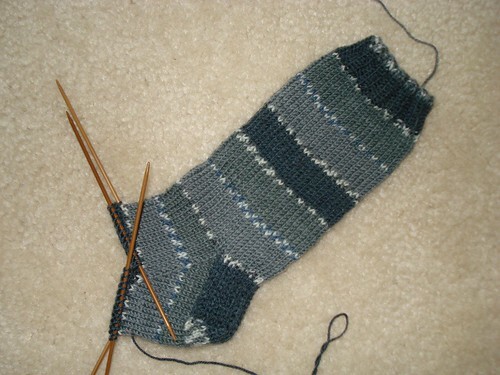 Again, just a generic pattern I made up for his foot size worked on the same size needles as I did his Daddy's socks. Won't they be cute this winter with their matching socks?